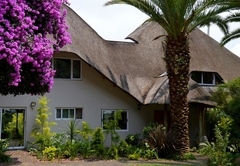 Highveld Splendour Boutique Hotel is a highly recommended Ermelo boutique hotel providing accommodation in 10 guest rooms for tourists visiting the Grass & Wetlands region. 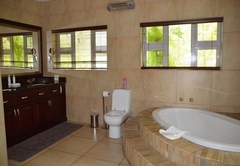 Ideally situated on a working farm only 8km from Ermelo, on the Breyten / Carolina Road, halfway between Gauteng and Swaziland and Maputo (it is 70km shorter and much faster to drive to Maputo via Swaziland using the Goba Border post into Mozambique) as well as to Ponta Do Ouro in Southern Mozambique, this contemporary, luxury establishment offers a peaceful venue away from the hustle and bustle of town and the noise and dust of coal trucks. 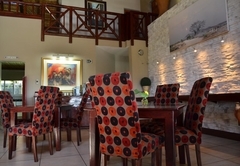 At Highveld Splendour Boutique Hotel we make you feel at home. Run as a family business we offer friendly and efficient service. All our rooms are very spacious, luxurious and comfortable with Super king-size, extra length beds and goose down duvets and pillows. Under floor heating and double glazed windows keeps you warm in winter. 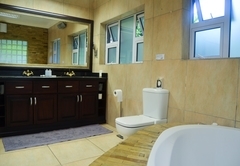 All rooms have baths and showers as well as an outside private patio. 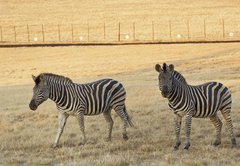 We have a 5ha lush garden with many big trees and a beautiful view of the highveld grasslands with zebra and springbuck on the farm. 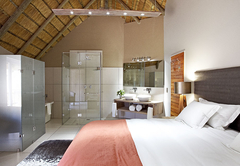 Ideal if you would like to break away from the city life and enjoy a bit of the countryside’s peace and quiet in luxury. 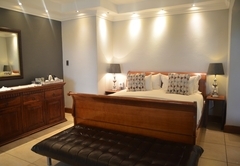 We have eight Luxury fully equipped en-suite open plan rooms with high quality beds, private patios, full HD DStv with flat screen LED TV’s, a stocked mini-bar, desk, hair dryer and safe. 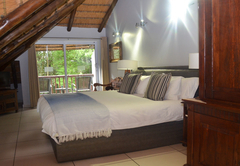 One room is an Executive / Family / Honeymoon Suite which consists of a King Size, extra length bed, living room area, separate bathroom, two patios and full HD DStv bouquet plus all the other luxuries the other rooms have. 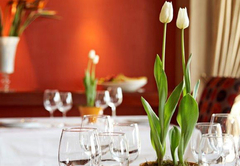 We offer delicious three course dinners, complimented by excellent high quality wines, by prior arrangement, prepared by our qualified French Cordon Bleu chef and a delicious farm breakfast. 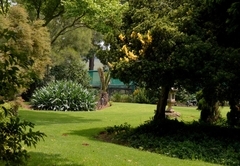 All herbs and vegetables are grown in our organic garden on the farm. 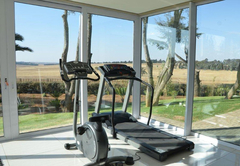 We also have a fully equipped modern gym as well as a sauna and steam room to help you relax. 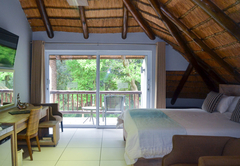 In addition, by appointment, you can enjoy a relaxing massage, pedicure or manicure in the comfort of your room or even outside with a beautiful outdoor view of the highveld. A very cosy pub and huge outside area under umbrellas further enhances your relaxation as does the beautiful blue swimming pool. 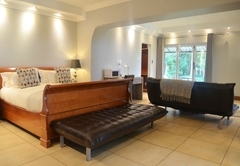 Highveld Boutique Hotel is truly an unexpected gem in the highveld, and ideal for both business and holiday travellers. 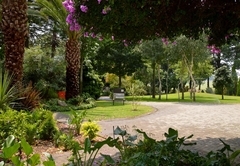 Rated number one by Trip Advisor, there is really nothing like it in this area offering such luxury and a unique setting at an affordable price. 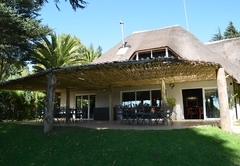 Why not spend a weekend and explore various 4x4 routes in the area, as well as visit the quaint Chrissiesmeer or see where the Vaal River starts. Bookings are essential. 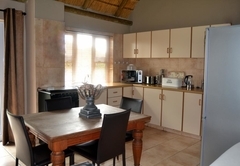 All have their own private patio, DSTV, HD Plasma LED TVs, mini-bar fridge, desk, hair dryer and safe. 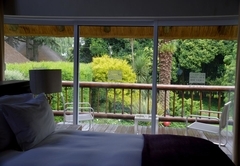 To lock in the warmth each room has under floor heating and double glazed windows. Delicious Dinner is also available with Prior booking only. 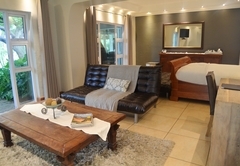 This room has 2 private patios, DSTV, HD Plasma LED TVs, mini fridge, desk, hair dryer and safe. 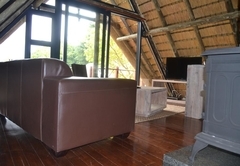 To lock in the warmth the room has under floor heating and double glazed windows. Sleeper couch suitable for two children under 13. Dinner by Booking only. This is a open plan unit with one bedroom. 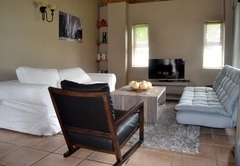 spacious living room with Flat screen and DSTV/ kitchen and a fireplace to keep you warm in the winter. 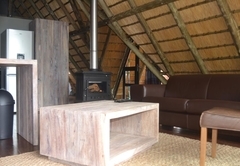 The unit has a flight of stairs and a thatch roof.Only continental breakfast. Dinner by booking only. WOW! What a wonderful place. After a long day on the road checking into this place was so great. Over sized beds and great pillows. The breakfast was top ten and all the staff helpful. Have told family and friends that this place is worth going to just for being so great and a perfect get away with someone you love. 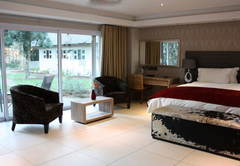 Response timeHighveld Splendour Boutique Hotel typically responds to requests in 5-10 minutes.